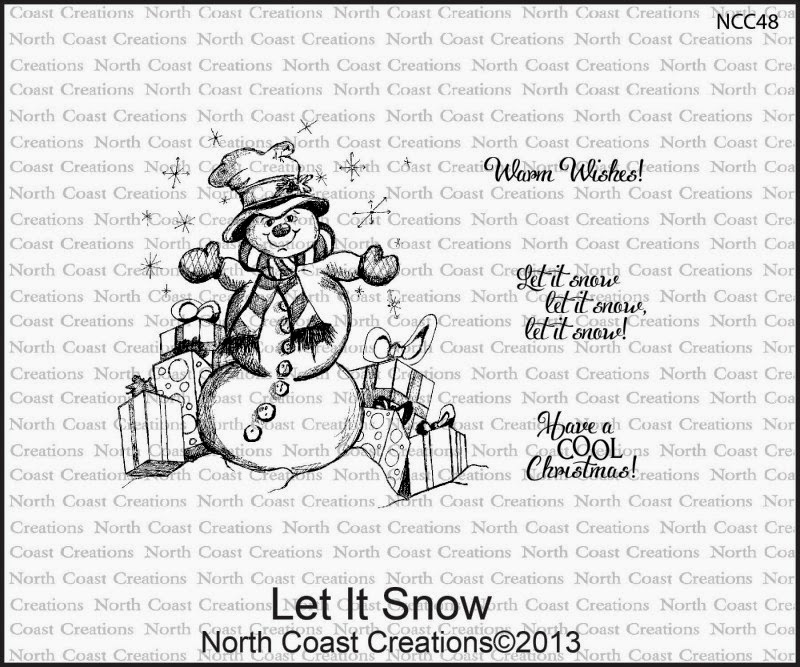 This month North Coast Creations is releasing three Christmas stamp sets - Warmest Wishes, Joy and Let It Snow. 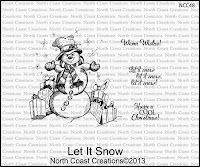 Continue reading below to find out how you can win one of two North Coast Creations $10 Gift Certificates good towards the purchase of NCC Stamps. You can see all of the October Releases here. Both of my cards use the snowman image from the North Coast Creations Let It Snow stamp set. The image is stamped in Black Archival on Vanilla card stock and colored with a combination of STAEDTLER Karat Watercolor Markers and Spica Glitter Pens. I added the clouds in Blue by sponging around a Scallop edge, then die cut using Spellbinders Oval Dies and layered on a Black Oval. I embossed the Snowflakes on the pattern paper, and die cut the corner snowflake embellishments using Our Daily Bread Designs Custom Fancy Ornaments Die. To embellish, I added some Zva Creative Crystal Gems. To create this card, I stamped the snowman image from North Coast Creations Let it Snow stamp set in Black Archival on Vanilla card stock and colored with a combination of Spica Glitter Pens and STAEDTLER Watercolor Pencils. To add detail to the design, I die cut a portion of one of Our Daily Bread Designs Custom Fancy Ornaments Dies from Black card stock three times to layer under one of the pattern paper layers. To embellish I added a Red Seam Binding Bow and Zva Creative Crystal Gems. 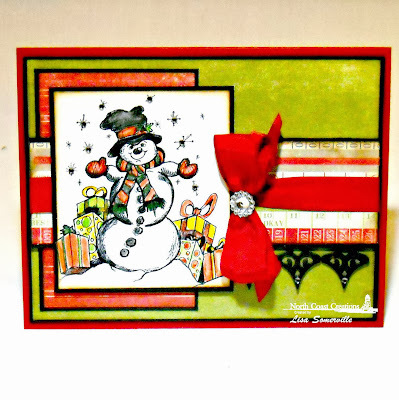 Two randomly selected winners will each receive a $10 gift certificate to North Coast Creations, good towards the purchase of stamps, just for commenting on the Design Team cards! You have until Thursday, October 17th, at 10:00pm EDT to leave your comments. Winners will be posted October 18th, on the North Coast Creations Blog, so be sure to check back there to see if you are one of the winners! BBB! Bold, Brite, Beautiful! Love the colors you choose, and he indeed, is a very happy snowman! Both are so fun and so colorful, Lisa! Super papers and layouts! Lisa, your snowman is great. I love the way you colored him. I also like the fold on your 2nd card too using last years release of the snow everything, which still remains my fav all time ODBD release. Great incorporation of the two. Lisa, I like your choice of colors, very unique. Best of all I like the way you did the clouds behind the snowman. Super Cute Cards!! Love how you made one traditional & one tropical!! 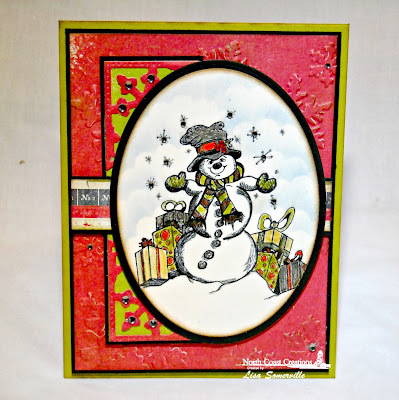 Such adorable snowman cards!! Love the little die piece detail!! Cute, cute snowmen!! Love the Fancy Ornament layer! Both cards are adorable! Love the colors and coloring - TFS! Lisa these are fantastic! I love the color choices! Beautiful! Really sweet cards, Lisa. I love that green color you used. The first card looks like it is pink? or maybe it is red. Very fun cards.